BEIJING, Feb. 8 (Xinhua) -- The fact that China has accomplished in the past 40 years of reform and opening up what had taken the Western industrialized countries several hundreds of years to achieve is truly a miracle in human history. But this is not the end of the story. "China's door of opening up will not be closed and will only open even wider," Chinese leadership pledged to the world. More changes brought by further opening-up measures are taking place around the country. Take a look at what Xinhua reporters have found when taking a fact-finding tour in Shanghai, Henan and Shaanxi. Lisa Liu, marketing director of Festo (China) Ltd, a German automation technology manufacturer, believes the company's best days in China are yet to come. Since it entered the Chinese market in the 1980s, Festo has secured its position as a leading provider of smart manufacturing solutions in the world's manufacturing powerhouse. "You could never imagine how eager Chinese industries are for smart production plans we provide, as they are craving industrial upgrading" Liu told Xinhua. Her confidence is underpinned by the country's new opening-up policy, which allows companies in the pilot Free Trade Zone (FTZ) to have easier access to more targeted customs services. Festo (China) Ltd, based in the Shanghai FTZ, is one of the first batches of foreign-funded companies that benefit from China's new policy, which enables Festo to operate at a lower cost with higher efficiency. Boosted by the new policy, it plans to expand its Asia-Pacific logistic center and customized production center in Shanghai. Pilot FTZs have become pioneers in promoting the country's reform and opening-up. The first FTZ was established in Shanghai in 2013 to blaze the trail, followed by 11 more across the country, from coastal provinces such as Fujian and Guangdong to inland provinces including as Shaanxi and Sichuan. Shanghai FTZ in Pudong published the country's first negative list with items which were off limits for foreign investment. The negative list has gradually been shortened as the opening-up drive expands, with items cut from 190 to 48. Forty years ago when China began to embrace reform and opening up, it created economic development zones to lure foreign investments. Compared with economic development zones, pilot FTZ aims to achieve "mutual benefit" and enable the country to participate in global economic cooperation and competition at a higher level, Luo Qinghe, a professor with the Shenzhen University, wrote in a research paper. Building pilot FTZs was a strategic move to deepen overall reform and widen opening up, and the country must further capitalize on the role of pilot zones as experimental fields of reform and opening-up, according to the Chinese government. In addition to FTZs, cross-border e-commerce pilot zones have become a new anchor of opening up and reform, as Chinese consumers have become increasingly drawn to foreign brands via e-commerce platforms. In the Zhengzhou cross-border e-commerce pilot bonded zone, a new customs model has been in practice since May 2013 to facilitate cross-border e-commerce. Before consumers place the order, imported merchandise has been shipped to a domestic bonded center, gone through quarantine procedures and put into customs files. After consumers place the order, the cross-border e-commerce platform will inform the customs authority who will complete clearance and inspection of the merchandise and then release the goods to customers. Such bonded zones play a key role in shortening the time of receiving products for consumers, said Xu Ping, president of the Henan Bonded Group that runs the Zhengzhou cross-border e-commerce pilot bonded zone. Thanks to favorable government policies, Henan, an inland province, has become a hot spot of opening up and reform, said Sun Jinglin, deputy head of the Henan Provincial Commerce Department. Figures from the General Administration of Customs show that between January and October 2018, retail imports of cross-border e-commerce reached 67.2 billion yuan (about 9.7 billion U.S. dollars), up 53.7 percent year-on-year. Boosting cross-border e-commerce will promote foreign trade, drive consumption and create jobs, according to Chinee Premier Li Keqiang. The government must take a holistic approach and exercise prudent yet accommodative regulation to fully unleash the growth potential of cross-border e-commerce, he said. The Chinese government has unveiled a new policy loosening cross-border e-commerce trade regulation. No requirements of licensing, registration or record-filing for first-time imports shall apply to the retail imports through cross-border e-commerce platforms. Instead, these goods will receive more relaxed regulation as imports for personal use. Moreover, implementation of this policy will be extended from the 15 cities such as Hangzhou to another 22 cities such as Beijing, which have just established comprehensive cross-border e-commerce pilot zones. 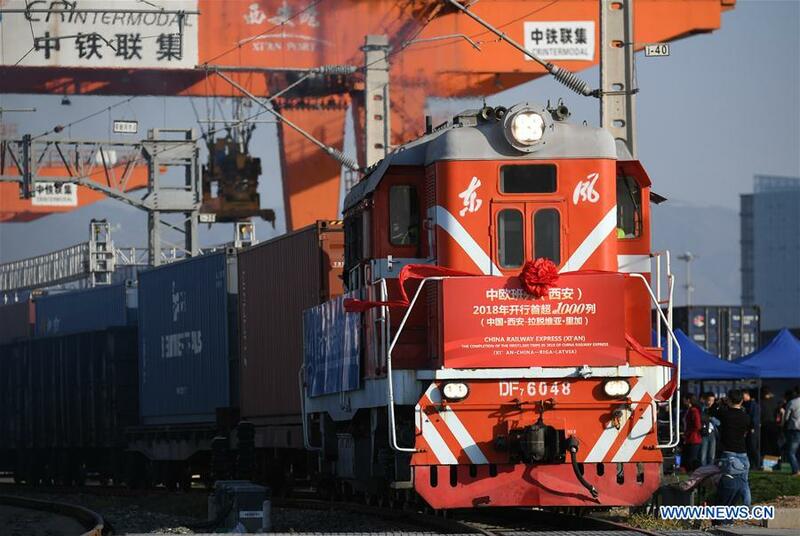 China-Europe freight trains made 6,363 trips in 2018, surging 73 percent from 2017, according to the China Railway Corporation. The freight service, a crucial part of the Belt and Road Initiative (BRI), began operation in March 2011. Over the years, trains have rumbled along the route, taking garments, auto parts, chemicals and other Chinese goods to European consumers, while bringing back European food, machinery, equipment and timber. Numbers are changing fast on the electronic screen in the monitoring and control center of the China-Europe freight train located in Xi'an International Trade and Logistics Park. The Beidou navigation system is helping track the trains in terms of temperature, humidity and the freight on board. "The China-Europe freight trains and the BRI are so important for us," said Liu Keqiang, deputy general manager of Shaanxi Automobile Group Holding Ltd. Thanks to them, the company has exported more than 150,000 vehicles over the years. In 2018, 12,757 units were exported, including 5,666 units to the Asia-Pacific region, central Asia and the Middle East. China is the biggest exporter of goods in the world, contributing 30 percent of global growth, said Stephen Perry, Chairman of Britain's 48 Group Club.